Last month I attended classes at House of Flyte and absolutely fell in love with this fitness craze. First of all, there is a certain amount of trust that has to happen in order to make this work. You have to trust yourself, the instructor, but in the case of suspension, you also have to trust the equipment. The silk hammocks hold up to 1000 pounds each, so that’s 2000 pounds total, which the instructor pointed out could hold a baby elephant! They are attached with mountain climbing carabiners and mounted to steel beams in the ceiling. That being said, I felt very safe that my equipment wasn’t going to fail me. They take you step by step through everything and you do as much or as little as you feel comfortable with performing. As I’ve said before, I am not a yogi, nor I am an acrobat, however you don’t need to be either to participate in antigravity workouts. Honestly, there are no skills needed! You maneuver the fabric (the silks) so that you hold different poses or perform tricks, like swings or skin the cat. You may also use it like you would a TRX trainer for exercises like push ups or tricep extensions. In my opinion though, the most beneficial aspect of antigravity yoga is spinal decompression. This fitness component promotes good spinal health and prevents injuries. Most of our days are spent compressing the vertebrae in our spines. As we age the space between the disks diminishes, pinching the nerves and causing pain. When you reverse gravity by hanging upside down from the hips in the silks (antigravity hammock), it allows the spine to fall into correct alignment. It’s a little intimidating the first time, but then once you relax, it’s the most incredible feeling! One thing I’ll point out that can be a little unnerving if you don’t know what it is, are the tiny dots (called petechiae) you may get around your eyes from the pressure of being upside down. This is totally normal if you experience it and they’ll disappear in a day or two. Of the more than a dozen classes I did, only once did I notice these. In addition to the huge benefit of spinal decompression, there are several other reasons why aerial yoga is so awesome! – It’s a great ab workout because you are constantly engaging your core to try to control your stability. – If you already do yoga, your mat poses will become easier to master. When you’re supported by the silks for difficult poses such as inversions you learn how the pose should feel when you kick up against a wall in a yoga class. – You wouldn’t think of aerial yoga as a cardio workout, however you’ll burn 200-300 calories on average in one 50 minute class! – There is ZERO impact! – It can reduce back pain. – You will see improved flexibility. As if all of the above wasn’t enough….the best part of antigravity yoga is that it’s FUN!!! You feel like you’re a kid on the swings or hanging upside down on the jungle gym at the playground. You can push yourself a little further out of your comfort zone each class by testing your balance or holding your inversion just a few seconds longer. I like to wear capri or long yoga pants and I found that a short sleeved t-shirt is more comfortable. The silks can rub against your underarms if you wear a tank top. The only other thing you need is a water bottle and an open mind! I feel so fortunate that I had the opportunity to visit the beautiful House of Flyte, but so sad that they closed their doors for good the end of July. In the time that I was there almost all of the classes I took were coached by Jessica. 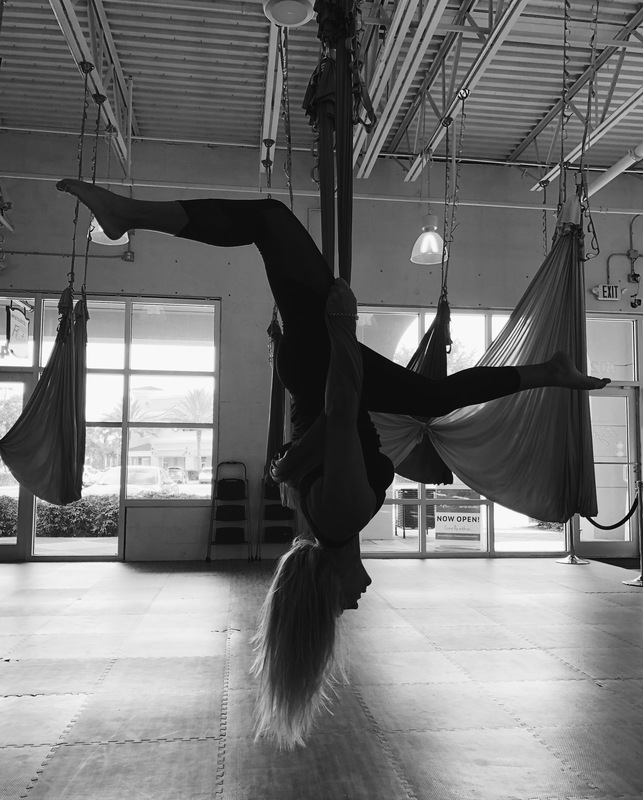 She discovered antigravity yoga three years ago and absolutely fell in love with it, so much so, she became a certified instructor and started coaching. Her passion for this is so evident when she’s teaching classes as well as when you talk to her about how she coaches a “tweens” class, helping young girls not only discover aerial yoga, but also giving them a confidence boost in the process. Jessica’s energy is seriously contagious and she does such an incredible job explaining the movements and making new people feel comfortable. (not to mention her photography skills are on point! lol) I also took an amazing aerial pilates class with Jamie while I was there. She and I bonded pretty much right away having CrossFit in common! 🙂 She too has that wonderful positive energy and passion that shines through when she teaches!